Dagnachew received BSc. in Electrical and Computer engineering in 2012 from Bahir Dar University, Ethiopia. 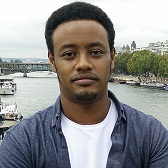 After working for about two years in academics in Ethiopia, he enrolled in the Erasmus Mundus Joint Master Program in Pervasive Computing and Communication for Sustainable Development (PERCCOM). PERCCOM is a joint program among Universities in France, Finland and Sweden and he has graduated with a Joint Master’s degree in August 2016. Starting from November 2016, he is working as an Early Stage Researcher in the SCAVENGE project at CTTC communication networks division.